One of the biggest misconceptions about Trump supporters is that they see President Trump the same way his critics see him, and yet they like him anyway. The implication of that belief is that all Trump supporters are racists because they damn-well-know they support a leader who is one. Hardly a day goes by without some stranger on Twitter telling me in ominous tones that I will someday pay dearly for being a racist “apologist.” They assume I see President Trump the same way they see him. Falling for a con is painful. The first reaction is to deny being conned, of course. The second is to blame skeptics for being correct in their skepticism. Here's the fundamental "story" of the Mueller Investigation: elites don't like "the little people" democratizing public narratives. The elites--who reckon their right to rule is self-evident--want to set the narrative and the context, because that's the foundation of power: once you get the citizenry to agree on your narrative and context, you secure two valuable things: 1) political legitimacy and 2) their obedience. This was the day anti-Trump forces in the media and Washington swamp were waiting for. Special counsel Robert Mueller finally turned in his report detailing the findings of his investigation. But things did not go according to plan, and Rachel Maddow burst into tears when Robert Mueller made this confession. For two years, Rachel Maddow’s MSNBC program was a one-stop shopping center for every insane news story involving Donald Trump and Russia. Brit Hume, the senior political analyst for Fox News, slammed the mainstream media for perpetrating the "worst journalistic debacle" of his lifetime, and their inability to learn anything from their actions. He spoke to Brit Baier on Fox News Special Report Monday. "If you think about it, Bret, this investigation actually goes back to about the middle of 2016, so it's been going on for quite a long time and this endless speculation about it and indeed the accusations about it that came out of many mouths on cable television and in the public prints, the list of people who got it wrong is really quite extensive," Hume said. The fact is that CNN set a low standard for behavior for not vetting any of the Russia Collusion stories it fed to the American people. Chris is trying to take the moral high ground here but he can't. Schiff on the Intelligence committee is like…what? Quite the contrary; everyone who pushed Russiagate conspiracy theories has destroyed their own credibility and reputations. Former CIA Director John Brennan said Monday that he "suspected there was more than there actually was" in regard to collusion between the Trump campaign and Russia in the 2016 election. "I don't know if I received bad information, but I think I suspected there was more than there actually was," he said on MSNBC's "Morning Joe" on Monday about the findings of special counsel Robert Mueller's probe. "I am relieved that it's been determined there was not a criminal conspiracy with the Russian government over our election," Brennan added. "I think that is good news for the country." Brennan's remarks came one day after Attorney General William Barr said in a letter to Congress that Mueller, who investigated Russian interference in the 2016 election, did not uncover evidence of conspiracy or cooperation between the Trump campaign and Russia. Mueller Report Decimates ‘Russiagate’ Hoax – What’s Next? The CIA is up to its old tricks: overthrowing a democratically elected government. Only this time it’s our government. "The Special Counsel’s investigation did not find that the Trump campaign or anyone associated with it conspired or coordinated with Russia … to influence the 2016 US presidential campaign." After two years of hearing from haters in politics and the media that President Donald Trump was "Putin’s poodle," an agent of the Kremlin, guilty of treason, an illegitimate president who would leave the White House in handcuffs and end his days in prison, we learn the truth. Reeling from Trump’s exoneration, big media are now scurrying to their fallback position: Mueller did not exonerate Trump of obstruction of justice. You were wrong, John. Flat-out, no question about it, WRONG! Over the last decade, Amazon has gained a near-total monopoly over Internet book sales, and late last month, we saw the dangerous consequences of such intellectual control as the company suddenly banned dozens of books, many of them of excellent scholarly quality. Apparently, activist organizations such as the ADL and the SPLC had succeeded in pressuring the company to ban those works to avoid any risk that American readers might become “confused” on certain controversial historical matters. For weeks, former CIA Director John Brennan has hinted that he believed Special Counsel Robert Mueller's investigation would end with the indictment of President Trump or another member of the Trump family. He suggested as much during a recent appearance on MSNBC, in which host Lawrence O'Donnell desperately tried to convince his audience that Brennan knew something they didn't. Now that Attorney General William Barr has received Mueller's report, and is not considering charges against the Trump family, Brennan is singing a different tune. "I don't know if I received bad information, but I think I suspected there was more than there actually was," he admitted on MSNBC's "Morning Joe" program Monday morning. Former FBI Director James Comey appeared completely stumped, and tweeted a picture of himself staring at the water with the caption, "Geologic time offers useful perspective." It shouldn’t come as a surprise the FBI and the DOJ obstructed justice last year when then acting FBI Director Andrew McCabe told the House Intelligence Committee to pound sand after Republicans demanded he hand over work-related texts. How can any free-thinking person ever again trust the media, the FBI, or the intelligence community after the debunking of this two-year Russia Collusion Hoax? This thing was not only a total hoax, a total lie, and total fabrication based on absolutely nothing, and not only a total hoax, a total lie, and total fabrication based on lies, it was also something that everyone knew was a total hoax, a total lie, and total fabrication. Hoping Dirty Cop Robert Mueller would find something-anything, or that President Trump’s approval rating would dive to where he’d be easy to impeach, the media lied-lied-lied; the Dirty Cops in the FBI leaked-leaked-leaked, and the elders and veterans of the intelligence community infested our TVs screaming about treason and indictments as they swore up and down the Trump campaign had never been spied on or wiretapped — when they knew damn well it had. CNN Worldwide president Jeff Zucker is pushing back against critics accusing the news network of being one of the chief propagators of a debunked Trump-Russia conspiracy theory after special counsel Robert Mueller cleared the president’s 2016 campaign of alleged collusion with the Kremlin. That's odd. When I took a journalism class in college we were told that we WERE investigators. So, okay, maybe CNN under Zucker weren't investigators, but it doesn't change the fact they were flat out WRONG!!!!!! In a stunning reversal, Cook County prosecutors on Tuesday dropped charges against "Empire" actor Jussie Smollett on disorderly conduct charges for allegedly staging a phony attack and claiming he was the victim of a hate crime. Somebody with a lot of juice intervened on behalf of Jussie. This sets a bad precedent that people can stage fake hate crimes and nothing will happen when they are exposed. That means there will be more fake hate crimes. Military diplomacy, strategic positioning and structures of commands are a well deliberated and articulated exercise that sometimes goes unnoticed to public. Like diplomacy, these are like the unseen icebergs sunk below the water. Appearances are deceptive. Deep below lie the jagged and abrasive ends of political realism. This might be the reason New Zealand has panicked and banned the video, the manifesto, and even the man's name! MARK DICE: They're Digging Themselves Even Deeper! As I said, Trump is America’s first Zionist president. But apparently Trump does not understand that a declaration he signs giving Golan Heights to Israel has no authority under international law. I doubt many others will prostitute themselves in this way, so all Trump has achieved is to line up the United States with Israel’s illegal absorption of occupied territory. European MEPs meet inside the European Parliament today to vote on a law that will forever change the World Wide Web ... and that vote was bribed for access to an oil pipeline, Tech Dirt reported. 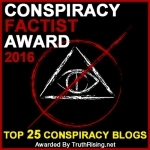 Truthstream Media: New Study Claims Conspiracy Theorists More Likely to Become Criminals! Half the country doesn’t trust anything you have to say. And after being accused of sedition for two years, conservatives have every right to be “sore winners” and pouncers. After all, this wasn’t your typical political debate. Michael Avenatti arrested, charges sound serious, yay Nike! Bad News for The News: The Fox-Disney Merger Again Shortens the Media Menu — The consolidation of two media empires is a disaster for those who want a diverse, independent media. One of the most puzzling aspects of the GMO experiment in the United States is what’s going on in other nations in comparison to here. For example, over 30 countries worldwide currently institute some sort of ban on GMO crops, and both Europe and Canada also have banned the bovine growth hormone drug rBGH, which has been the source of great controversy behind the scenes in the United States. All that controversy reached a breaking point at one local news station in Florida, where two investigative reporters sought out to find the truth about one of Monsanto’s most highly profitable, and highly controversial, products. The reporters, Steven Wilson and Jane Akre, went to great lengths in order to expose links to cancer and these Monsanto products, crafting a hard-hitting story that could have saved the health of millions of Americans. On January 31 last, the European Court of Human Rights announced its long-awaited decision to reject the appeal of the author of these “Comments” against his almost unanimous condemnation by seven different courts of law in Germany over several years for the “crime” by German law, of questioning on German soil in November of 2008 whether Six Million people really were gassed under the Third Reich... Now let us look at laws and courts which punish any questioning of the notorious murder of Six Million victims in World War II. Was it a historical fact, or not? If it was true, then to question it can be bad if the damage done is bad enough, but if the murder never took place, then it is in accordance with truth to call it in question, and not only is it not bad, it is positively good, to call it in question. Google search is hiding auto-completed text related to the Robert Mueller special counsel investigation, according to a Washington Free Beacon analysis. Mueller's investigation has finished with no further indictments, the culmination of a story that has dominated the news for the better part of two years. But the most popular search engine is avoiding the topic. Using Google search on multiple browsers and on private-browsing mode, the Free Beacon found Google search had an aversion to the search term "indictment." Appearing on Fox and Friends Saturday, former CBS News correspondent Lara Logan slammed the establishment media’s coverage of special counsel Robert Mueller’s now-concluded investigation, stating that journalists repeatedly presented the false impression that indictments brought by prosecutors were for collusion with Russia instead of other crimes. Beijing is already threatening retaliation over Washington's expected sale of dozens of F-16s and tanks to Taiwan. But as if ties between the world's two largest economies hadn't already been sufficiently strained, the Navy and Coast Guard again provoked the Chinese leadership on Sunday when they sailed two ships - identified as the Navy destroyer Curtis Wilbur and the Coast Guard cutter Bertholf - through the Strait of Taiwan. According to Reuters, the gesture, which is part of a redoubled US effort to flex its muscles near Chinese waters, should be interpreted - like other 'freedom of navigation' operations before it - as a sign of support for Taiwan, which is struggling with an increasingly threatening Beijing. The Chinese military has been holding more military drills and missions around the island, as President Xi has made bringing the wayward province back under Beijing's thumb a top priority for his rule. (Sigh) In his one-man show by American comedian, Ron White, there is a phrase which I have felt was in order, looking at the deeds of the US military, currently. At the same moment, while delicate negotiations about China's and the US's trade policy with one another continue, the only thing I can say here, is "You can't fix stupid". Actually, stupid and reckless, would be a better characterization of these acts, done right at the moment when US/China trade relations are already very strained. I could probably conjure up some other stupid and reckless scenarios, but the timing, on the part of the US government and military, could not possibly have been worse. There are two schools of thought in Washington about China; the first is, destroy it militarily, while we still can the US government plans to nuke Russia and China, or cage the rage, and figure out how to treat them as allies. As a Christian pacifist activist, I far prefer the second course of action. But there is absolutely no middle road, between confrontation, and peaceful trade; I hope (and pray) that those in the Bowels of Power in DC, understand that, regarding how we treat China. Glenn Greenwald: Russia Collusion 'Conspiracy' Was "Saddest Media Spectacle I Have Ever Seen"
Offering one of the most scathing responses to the Mueller report summary released Sunday night, Glenn Greenwald, a Pulitzer Prize winning journalist and founding editor of the Intercept, appeared on Democracy Now! Monday, where he lambasted the mainstream press for helping to perpetuate the "total fraud" that was the Russia collusion narrative. "This is the saddest media spectacle I have ever seen since I began practicing journalism in 2005 and what makes it even sadder is to watch all the people who invested their journalistic credibility into what proved to be a complete and total fraud and scam continue to try and cling to some vestige of credibility by continuing to spin conspiracy theories that are even more reckless and more unhinged than those we've been subjected to for the past three years." Glenn, I feel for you; and yes, the American people will not be paying attention to anything the corporate news states any more for quite some time to come. But by spreading the virus of "Russian Collusion" as a true narrative, that is what these presstitutes and waraspondents truly deserve, and they have brought it on their own heads; but this is absolutely the reality here. I have a great deal of respect for THE INTERCEPT, and I would think you would feel good about what we do here at WRH, should you happen to visit the site. The last few days have seen Boeing shares roller-coaster on market swings and idiosyncratic headlines (as Garuda started the worrying trend of canceling airplane orders). Today, Boeing shares slipped after Bloomberg reported that Airbus has secured a long-awaited aircraft order from China. The confirmation reportedly occurred during a state visit by Xi Jinping to the French capital, according to a person with knowledge of the matter. The deal is due to be announced as soon as Monday afternoon in Paris, said the person, who asked not to be identified discussing non-public information. While no details were immediately available of the deal, Bloomberg reports that the deal was initially touted more than one year ago by the French government as being valued at as much as $18 billion. Aerobus planes have not been crashing recently; and in their desire to get their newest airplanes up and running, Boeing did not do the due diligence with the inspections, which would have delayed the process, but would have meant the the planes were air-worthy. I can hear the SMACK! of class-action lawsuits, against both the plane manufacturer, and the two companies which flew the aircraft, without insuring that training on this was mandatory, and against Boeing for signing off on a plane which was defective in its manufacturing. WHY/HOW were some very professional people duped? What name should his band be known as? Senate Judiciary Chairman Lindsey Graham (R-SC) said in a Monday press conference that he's going to get to the bottom of "unprofessional conduct" and "shady behavior" by the Justice Department and the FBI surrounding the 2016 US election, and will call on Attorney General William Barr to appoint another Special Counsel "that would look into what happened with the FISA warrant," and "what happened with the counterintelligence investigation." Unfortunately, this will only happen when pigs...discover they are aerodynamic. I frankly wouldn't hold my breath on this. As we predicted a number of times before, a proxy war between Russia and the United States appears now heating up in Venezuela — this after over the weekend Russia sent a military transport plane filled with Russian troops commanded by First Deputy Commander-in-Chief of the Land Forces of Russia Gen. Vasily Tonkoshkurov, which landed in Caracas Saturday. We also reported the major development this morning that new satellite images reveal a major deployment of S-300 air defense missile systems to a key airbase south of Caracas. Russia's highly visible deployment of a small troop contingency along with a reported 35 tons of cargo has resulted in a direct and firm response from Washington as on Monday morning the US Secretary of State called on Russia to “cease its unconstructive behavior”. According to Reuters Pompeo conveyed the message directly via a phone call with his Russian counterpart Foreign Minister Sergey Lavrov. Wake up and smell those tons of reserve heavy crude being rudely pulled away from the US by way of a Russian "military presence" in Venezuela, invited by its LEGITIMATE LEADERSHIP, UNDER MADURO. And if you thought about pro-actively sending US troops to fend off Russian troops here, in the immortal words of my late Grandmother, "The horse is already out of the barn, which is what she would say if a situation was already out of control, and couldn't be fixed. If you were even thinking/fantasising about a decap strike on Caracas, it is too bloody late now. So what are you going to do now, just sit there and whine about missed opportunities, because you waited too long to do them?!? And your telling Lavrov (who I consider one of the adults in the room in geopolitics) that "... the United States and regional countries will not stand idly by as Russia exacerbates tensions in Venezuela." Was that ever a rich "pot...kettle...black" moment for you, considering all that the US has done to instigate regime change in this country; and sir, your options just got royally minimized here. It is almost painful to see how many chess moves ahead Russia's President Putin is, ahead of US foreign policy. Opening the Washington Post today, we were aghast. Prominently displayed on page 8 was a full-page ad falsely accusing Representative Ilhan Omar of being anti-semitic. “The Jews control the world with their money” – words Rep. Omar NEVER said – were splattered next to her face, leaving readers to assume it was a quote. The ad was produced and purchased by the notorious Rabbi Shmuley, a hate-monger whose agenda is well-known: to demand U.S. compliance with Israel’s status quo of occupation and apartheid. Why is the Washington Post allowing Shmuley to purchase such an outrageous ad inciting hatred against the first black, Muslim hijab-wearing member of Congress? Contact the Washington Post now. Tell them to apologize to Rep. Omar and promise not to print ads that propagate lies and hate. We will hand deliver your signatures to the Post. Still reeling from the pain of the Mueller report's failure to deliver any additional indictments, Joy Reid this morning fantasized a list of possibly impeachable offenses. The most hilarious, reflecting Reid's unfamiliarity with the Bill of Rights, was her claim that Trump's "attacking the media" could be grounds for impeachment. Reid said that while the criticism isn't a crime, "it's a violation of the First Amendment in a lot of ways." The short version? Mueller is done. His report unambiguously states there was no collusion or obstruction. He was allowed to follow every lead unfettered in an investigation of breathtaking depth. Robert Mueller did not charge any Americans with collusion, coordination, or criminal conspiracy between the Trump campaign and Russia. The special counsel also considered whether members of the Trump campaign “coordinated,” a much lower standard defined as an “agreement, tacit or express,” with Russian election interference activities. They did not. New Zealanders are debating the limits of free speech after their chief censor banned the 74-page manifesto written and released by the man accused of slaughtering 50 people at two mosques in the city of Christchurch. The ban, issued Saturday, means anybody caught with the document on their computer could face up to 10 years in prison, while anyone caught sending it could face 14 years. Some say the ban goes too far and risks lending both the document and the gunman mystique. At the same time, many local media organizations are debating whether to even name the Australian man charged with murder in the March 15 attacks, 28-year-old Brenton Tarrant, after New Zealand Prime Minister Jacinda Ardern vowed she would never mention him by name. In some ways, Tarrant’s manifesto provides the greatest insight into his character and thinking, with neighbors and those he met in a gym in the sleepy seaside town of Dunedin recalling nothing particularly remarkable about him. Whenever officials in Washington, D.C. set out to overthrow a foreign government, mainstream US media outlets are there to give a helping hand. All pretense of fairness and balance disappear in favor of outrageous distortion. For the most recent example, let’s look at Venezuela. Both high-level Republicans and Democrats have decided it’s time for Venezuela, with the world’s largest oil reserves, to rejoin the US sphere of influence. Hawks may call for direct military intervention while doves seek punishing sanctions, but all agree that the elected government of President Nicolas Maduro has got to go. Gone are the days when US consumers looked to the nightly news and print media as a trusted source of information, and especially if they hold conservative views, according to a new poll by the Columbia Journalism Review. Things are going from bad to worse for the US legacy media as its trust credentials have reached an all-time new low, as if that were possible. It has even achieved a lower trust rating than lawyers and members of Congress. The introduction to the CJR poll provided the following ominous opening: "For decades, we’ve known that Americans don’t trust the press. What we haven’t known is how people view the makings of journalism, from the use of fact checkers and anonymous sources to the question of whether money skews journalistic decision-making. This new national poll for CJR answers those questions, and points to how big the trust gap remains." Indeed, the cynicism on the street should have every mainstream media purveyor in a state of absolute panic. The Mueller Report Is In. They Were Wrong. We Were Right. The contents of the report are still secret, but CNN’s Justice Department reporter Laura Jarrett has told us all we need to know, tweeting, “Special Counsel Mueller is not recommending ANY further indictments am told.” On top of that, William Barr said in a letter to congressional leaders that there has been no obstruction of Mueller’s investigation by Justice Department officials. Now is the time for the GOP to go on the offensive. It has already started with Lindsey Graham calling for investigations into the FISA warrants and to just where the accusations of collusion came from. Israel and Hamas are on the brink of war – again – just two weeks before Israelis go to the polls to decide whether or not to reelect Prime Minister Benjamin Netanyahu. Seven people were wounded Monday after a family home north of Tel Aviv was hit by a long-range rocket from the Gaza Strip. The IDF immediately prepared to call up troops and Netanyahu canceled his AIPAC appearance, cutting short his celebratory visit with Trump - to laud U.S. recognition of Israel’s annexation of the Golan Heights. As Chemi Shalev notes, Hamas knew exactly how to rain on Netanyahu’s victory parade. Netanyahu’s rivals were quick to pile on blame and chip away at his security image. Amos Harel explains how this all comes just a day after Netanyahu, in a botched TV interview, raised new questions about his involvement in the ‘submarine and state secrets’ scandal. The timing is just too cute. This does not help HAMAS. It helps Netanyahu! This coming weekend is the one year anniversary of the Great March of Return where a million Gazans are expected to march along the fence. An Israeli attack would derail that. And apparently, that Iron Dome system didn't work. In fact there is no mention of it even being used. This smells like a classic Israeli false flag. English media claims to have exposed that the terrorist group “Islamic State”, or ISIS, as they are losing control over Syria, have planned terrorist attacks in Europe. This much is said to be revealed in documents found in the territories liberated from the militants, The Sunday Times reported . According to the publication, the plan involves the use dormant cells located in the West, also known as sleeper cells, to carry out the attacks. In the last number of years, there have been a number of terrorist attacks in Europe. According to public record and revised history, there is no chaos in the aftermath of a disaster. Nobody panics, nobody loot, and nobody goes hungry. But preppers know differently. Scott Adams: I Created This Comic Two Months Ago. It Ran Today. How's My Timing? People will hallucinate iterations. People are now saying that there must be a connection between a dud Mueller report and Trump recognizing the Golan Heights as Israeli territory. It's already happening. The "If Hunt" has begun. Wouldn't this be the time to make people rethink 9/11 while many same-player, Deep State actors are on their knees (and while Trump Derangement Syndrome #TDS sufferers are resolving their cognitive dissonance) -- rather than chasing random butterflies like silly kittens? Where is the Tweeter in Chief? Why post-Mueller major-win silence? Fox News Poll: Will Mueller report change your current opinion? How does the pro-climate change side explain the anomaly? I am hoping and praying, that President Trump "sees the light" of non-intervention in this situation. Under the directorship of torture and black site maven Gina Haspel, Donald Trump’s Central Intelligence Agency has returned to its traditional roots of conducting “black bag” operations and disrupting electrical grids through cyber-attacks. I have been profoundly disappointed in Haspel's having been nominated, and confirmed, as head of the CIA; President Trump knew what an "interesting piece of work she was", professionally, yet put her name into consideration, and she got confirmed anyway. Taking down Venezuela's electricity grid, if in fact the US did it (and at this point, given the lust for Venezuela's oil reserves our leaders want to control, I think it points to a US plot) is absolutely an act of war. Unfortunately, however, I am concerned that the mayhem may continue in many other formats, until the current Maduro government resigns, and Gaido's US puppets are "anointed" as Venezuela's "true government"
Russia has stated, incontrovertibly, that they will "protect their interests" in Venezuela. At the worst of it, we may see war break out between Russia and the US government forces, at some time in the near future, which would be horrific in the extreme; and I say this, because at this point in their history, the American military doesn't have the weaponry; the manufacturing, the money, or the troop strength to insure a positive outcome in such a war. I think for many it is an anticlimax, absolutely. There's so much invested here. Two plus years, millions of dollars, political capital on both sides, and you've got people who have lost their livelihoods. A lot of the people that were brought in, their names exposed, their reputations were damaged. We've got the six people that have been charged [for] things that happened ten years ago; some are financially ruined now; some will spend time in jail for lying to Congress or lying to the FBI over minor financial things that may have gone unnoticed without this. You look at the other side too, and we've got damage to international relations, not just with Russia, where what has occurred is just outrageous, but also Europe. I mean we forced Europe to follow through on sanctions that there's no evidence for. They've lost business as a result of that, so I'm sure the Europeans will be quite interested in seeing more and learning more about what's coming out of this as well. UNBELIEVABLE CLIP from 1975 shows how the CIA has embedded in our NEWS media to manipulate the public. You can stop teaching history but you can never erase it. Well the worst Putin Puppet of all time is at it again, this time tweeting that the US must recognize the Golan Heights as part of Israel despite the fact that the Israeli occupation of that Syrian land is illegal under international law. “After 52 years it is time for the United States to fully recognize Israel’s Sovereignty over the Golan Heights, which is of critical strategic and security importance to the State of Israel and Regional Stability!”, Trump’s tweetreads. Russian parliament member Oleg Morozov made a statement in response to Trump’s proclamation, saying that “Russia will never agree to recognize Israeli sovereignty in the Golan. Trump is damaging the international community and the Arab world”. What happened was the following. At that point, leadership in Crimea understood that there was no legitimate government in Kiev, and did two things at that point. First, they held a referendum for the Crimean people, asking if they wanted to stay with Ukraine, post-putch, or petition the Russian federation for membership. Overwhelmingly, the Crimean people, in a very clean vote, observed by local and foreign representatives, to leave Ukraine, and petition the Russian Federation for membership. The Russian Federation accepting Crimea's membership, and all was well. That is, except for the US huffing and puffing that the Crimean people had no right to peaceful self determination, as stated in the UN Charter, to which the US is I(allegedly) a signatory. The US cannot have it both ways; if they cannot commit to supporting the UN charter, it might as well withdraw its membership to the organization. There was zero annexation here, but a real-world expression of that freedom for self-determiniation by the Crimean people. On the other hand, the Golan Heights was seized by Israel, with the citizens of the Golan given no right to any representation whatsoever, except under Israeli edict. This is an occupation, and an annexation, which is the polar opposite of what happened in Crimea, after the Western-orchestrated Putch put Poroshenko in power in Kiev. Serious concerns have arisen over how New Zealand Prime Minister Jacinda Ardern has handled the recent Christchurch mosques massacre. And they don’t just involve her calls for stricter gun control and decision to ban all semi-automatic rifles. Rushing design on as complicated a craft as was the 737, almost guaranteed that something was going to go wrong, and unfortunately, those flaws cost hundreds of lives; I frankly think that Boeing may not be able to recover, because of a cascade of class-action lawsuits against them on this issue. Theresa May may have days, if not hours, left as prime minister of the UK following a full-blown cabinet coup on Saturday night as senior ministers moved to oust the UK prime minister and replace her with her deputy, David Lidington. According to the Sunday Times, following a "frantic series of private telephone calls", senior ministers agreed the prime minister must announce she is standing down, warning that she has become a toxic and “erratic” figure whose judgment has "gone haywire." The plotters reportedly plan to confront May at a cabinet meeting on Sunday and demand that she announces she is quitting. If she refuses, they will threaten mass resignations or publicly demand her head. The "conspirators" were locked in talks late on Saturday to try reach a consensus deal on a new prime minister so there does not have to be a protracted leadership contest. IF, at the end of the day, there is no Brexit, the British people who voted for it, will be very, very angry, with a profound sense of betrayal by Parliament. And as to what form that anger might take, I do not know. But to organizers, of any protest, make sure that those demonstrating are completely peaceful; if they are not, that will only encourage the military and police to start shooting to kill on site. The independent media, like WRH, called it from the beginning; a smear job with utterly no substance, to attempt to derail Trump before the 2020 elections. Yes, there were convictions along the way, allowing Mueller to notch a couple more convictions into his belt; but nothing which ever tied President Trump to Russia. The media is downplaying the health risk of the Petrochemical Fire in Deer Park, Texas. Millions of pounds of unburnt Naptha, Benzene, Toulene, and Xylene is being released. The corporate media (yes, even FOX) are pushing the line that just because Mueller didn't find any evidence of collusion between Trump and Russia doesn't mean it did not happen. Logically, they are correct; you cannot prove a negative. That being said, in our system one is presumed innocent until proof is provided beyond a reasonable doubt. Since this debacle began, the corporate media and Democrats have returned to code Napoleon; presuming Trump guilty and demanding he prove he is innocent. I have to wonder if the current spin on the Mueller report, that it does not exonerate the President, is because of their hate of him, or more about trying to save face after being proven wrong all these months. Failed Magazine Editor Bill Kristol Tried To Stir Up Some Attention By Calling Kurt Schlichter A Racist. It Did Not Go Well. There are currently 2 users and 1340 guests online.